One random Sydney girl (thats me!) & the six degrees of Kevin Bacon! 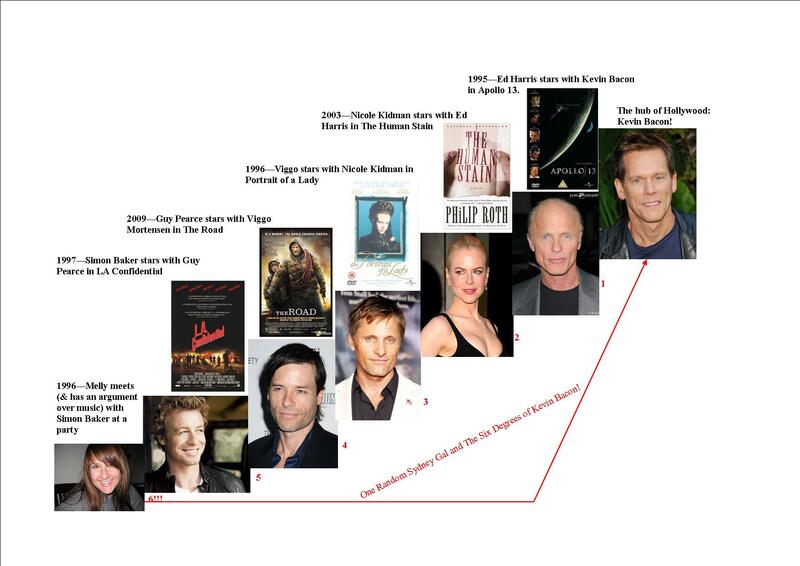 OK – so I love Kevin Bacon and a few years ago I realised that I had 6 degrees of separation to Kevin Bacon! Explanation of the Bacon Number here. There are several other variations including Matt Dillon, Renee Zellweger and Russell Crowe that I came up with on my own, but I then found this website that kindof takes the fun out it all, oracleofbacon.org, and you can type in anyone and it will give you the Bacon Number (this helps with all the relatively unknown actors that pop up from movie to movie…) According to the oracle Simon Baker has a Bacon Number of 2 which makes me Bacon #3!!! and another girl I went to school with (I was friends with her brother as she was a few years younger than me) has a Bacon Number of 2 which means again, at best I have a Bacon# of 3!!! Rhiana Griffith -> was in Pitch Black with Keith David -> who was in Novocaine with Kevin Bacon! And let’s not forget how totally cool he was in Will & Grace playing himself! Goes to show that the small world phenomenon is actually true in my household! You met Simon Baker?!! that is seriously cool! He is soooo hot – I love The Mentalist! I loved that moment when Kevin Bacon claps his hands and the Footloose music instantly plays – then he and Will dance like crazy.